Take A Trip to the Tree Farm! A few TIPS before you get started! According to the National Christmas Tree Association (yes, there's actually an association for this!) cutting down a Christmas tree is a 2-person job, so bring your BFF or partner. Heck, bring everyone! While one person cuts the tree, the other holds the limbs out of the way and guides the tree as it falls. TIMBER! Typically, a saw will be provided to you - pretty cool! However, be prepared and ask your selected farm by giving them a call before you visit. You'd hate to arrive in your lumberjack gear and be unable to actually cut one down! Now, what to wear? Girlfriends, leave the stilettos at home. Wear boots, dress warm, bring gloves and get ready for some outdoor fun! Many farms offer wagon rides to be taken through the acres of trees, bonfires to roast marshmallows and cider to sip on. It is a full-on festive experience! Speaking of experience, really let loose and make the most of this one! Be prepared for a full day of fun, and why not bring the whole crew? Now, please don't shoot the messenger, but leave the family pet at home. Many farmers don't want the cute pup with you, as they are often afraid of trees being, ahem, "marked!" So call first to see if pets are allowed and, if so, always bring a leash. If you're curious about the types of trees that will work best for you, then we suggest you do a bit of homework. Here's a helpful tree guide that will help you become familiar with the most popular trees grown on farms nationwide. Many farms will help you shake off any dead needles, wrap the tree, put it on a stand, and even sell you a stand, to help you get on your merry way. Don't forget to load up on garland and buy a fresh wreath while you're at it! Nothing smells better than the forest pine scent in a living room with the waft of a fireplace. We just love it, and we are feeling so ready for the season! How about you?! We know you're going to have a blast and please let us know how it goes! Post your pictures to our Facebook page, tag us on Instagram or send us a Tweet! We love seeing you all enjoy our favorite time of year as much as we do! 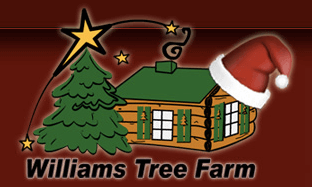 Helping make holiday memories for over 60 years, Williams Tree Farm is one of the biggest tree farms in the Illinois. Along with over 350 acres of trees to choose for the perfect tree, they also offer winter activities such as hayrides, a kiddie train and a children’s farm. Even Santa pops by this farm to say hello and pet the animals! Wondering where to pick up the perfect Christmas tree? 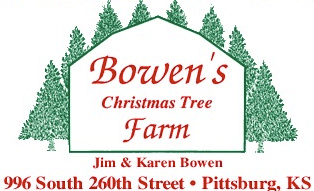 Look no further than Bowen’s Christmas tree farm. With a huge assortment to choose from, Jim & Karen Bowen will ensure that this tree will make your holiday season that much more memorable! For over 20 years, Paula and Bill Jacobs have been providing the community with quality Christmas trees. 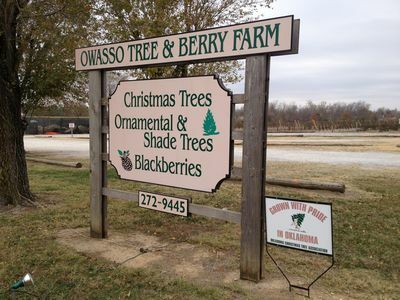 Known as the perfect farm to find your special holiday tree, Owasso offers a cornucopia of Christmas trees to ensure that your holidays are enjoyable as well as a memory to be treasured. After you have selected your perfect tree, Owasso offers a hayride back to the cabin where you can warm up with delicious cider and browse around for ornaments for your tree. Cozy! At McCarthy Tree Farm, the spirit of Christmas is tradition, family, and friends. Stop on by and enjoy the campfire while sipping warm cider and listening to Christmas music. Make cutting a live Christmas tree a holiday tradition for you and your family at McCarthy Tree Farm. With a rich history, Glove Hollow has been owned and operated by the Ahern Family since 1897. 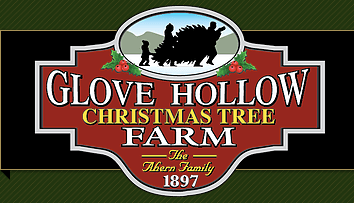 With over 75,000 trees on 435 acres, Glove Hollow Christmas Tree Farm is a wholesale and cut your own Christmas Tree establishment. Their fertile river-bottom land along the Pemigewasset grows some of the finest Fraser and Balsam Fir anywhere. The hand-shearing techniques paired with the fertilizer program are used to produces a natural looking tree with good color. Owners John & Cynthia Curtis have a big love for trees. With their 40 acre farm, they grow over 42 different varieties of trees to choose from. Perfect Christmas Tree Farm offers you the perfect tree for your space, the look you want, and at a price you can afford. You can choose and cut your Christmas tree or select a pre-cut tree or a tree grown in pot to plant out door after the season ends. For those who like classic, traditional trees, or rare exotic Christmas trees, you will be able to find the perfect Christmas Tree for you and your family! Activities: U-Cut/Fresh Cut Trees Hayrides Story time with Mrs. Claus Christmas Shop Concessions Crafts Petting zoo Tea party Wreaths Tree Types: Balsam Fir, Fraser Fir, Concolor, Canaan, Douglas Fir, Blue Spruce, Scotch Pine, Grand, Turkish, Korean, Nordman, Nikko Fir, and many more. 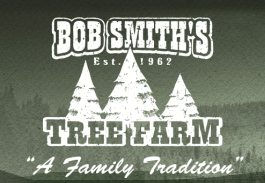 This season, Bob Smith’s Christmas Tree Farm is bringing back an exciting tradition to keep the holiday spirit alive! Established in 1962, the Anchorage farm is hosting a great variety of trees, being one of the only remaining Christmas Tree farms in the area! Ranging from Balsam Firs and Colorado Spruces to Norway Pines and Fraser Firs, this Alaska farm has everything to meet your needs and make your holiday the best one yet. 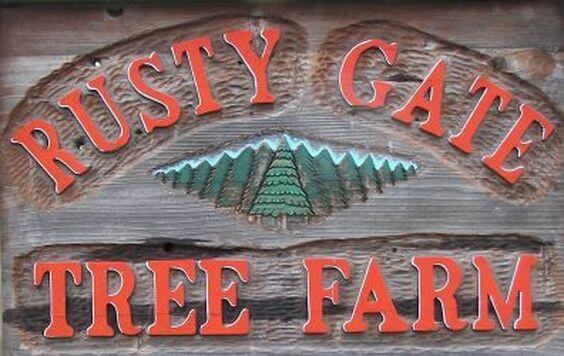 Located just an hour away from Idaho’s Coeur d’Alene, Rusty Gate Tree Farm is giving you the opportunity to find your perfect tree for the holidays! Officially opening its doors the day after Thanksgiving the Idaho farm will allow you to choose from a large variety of firs and Colorado blue spruces - all at reasonable prices! They will even shake the old needles out of your tree and wrap it up, free of charge! Choose from a wide selection of fir and noble trees, pick your favorite holly, evergreen, and eucalyptus wreaths, or purchase garlands, kissing balls, and mistletoe - this Portland destination has everything and more to offer! Not to mention snow-filled slides, Santa visits to the farm, hot and appetizing refreshments, and friendly farm animals! You can also head over to their 100 year old milk barn and check out the Farm store, where you’ll find fresh produce, baked goods, homemade jams, kettle corn, and other festive items. Located in Stockbridge, Georgia, Yule Forest has been in operation for over 35 years and serving up a wide variety of Christmas trees and wreaths. This season, head to the fabulous farm and pick out the perfect Christmas tree, all the while sipping on delicious apple cider and listening to festive music. But wait, there’s more! Jump on the hay rides, take a tour of the farm, meet Santa Claus, make candy canes, explore the trails, see the agricultural exhibits, or run through the obstacle course! If you adore the holiday season, then this is certainly a great stop for you! 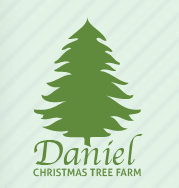 With their first tree planted in 1980, Daniel Christmas Tree Farm has maintained a wonderful variety of trees throughout several generations. Based in the small city of Dunn, this North Carolina farm is warmly welcoming you to keep up with your holiday traditions, start new ones, and join in on the farm fun! Choose from six different kinds of Christmas, including Carolina Sapphires, Fraser Firs, Leyland Cypress’, Red Cedars, Virginia Pines, White Pines! Once you’ve picked out your favorite tree, catch a wagon ride around the farm! After that, jump in on a wreathing-making class or chow down on s’mores around the fire pit! Doesn’t that sound great? Since 1980, Lazy Acres has been playing a big role in family traditions, opening up its 120-acre farm to create incredible holiday memories. Continuing with that same enthusiasm, this Mississippi farm is hosting a number of activities to delight you throughout the festive season. This winter, get your family and friends together, find the perfect Christmas tree, meet with Santa & Rudolph at his workshop, then enjoy a hayride during an all-new, interactive outdoor light show! 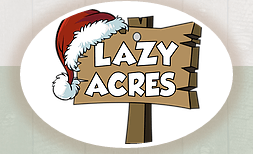 Celebrate this special time of the year with Lazy Acres. Mountain View Christmas Tree Farm offers a fun and educational experience for the whole family. Take a guided tour through their evergreen forest and select the perfect tree for the season! You can cut your own or just pick one that's been freshly selected. Make sure to visit with the farm animals while you're there, and stay warm by cozying up by the fire and roasting hot dogs and making s’mores. Glorious! Come experience some holiday farm fun at Elgin Christmas Tree Farm. So much to enjoy, where to begin? Take your time finding the perfect tree, select your perfect, freshly made wreaths, embark on a scenic hayride, spend some ooh'ing and aaah'ing time with the farm animals, get lost in a crazy maze and more! Too much adventure for you? Then take a moment to shop – decorations and gifts at the Christmas Cottage are perfect for the home and stockings! 10 Farm Camps for this Summer! 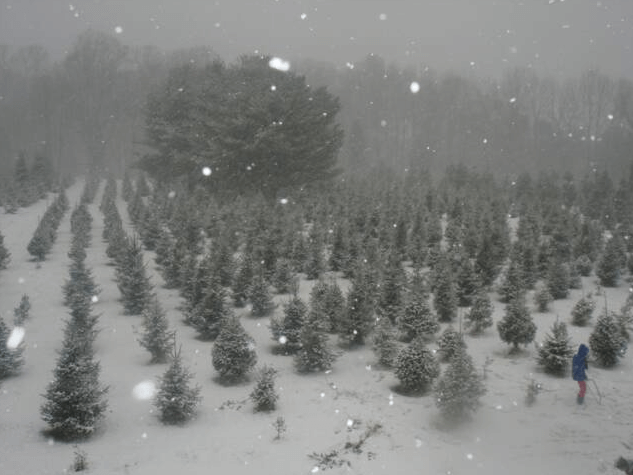 Plan a Trip to the Christmas Tree Farm! October is Farm to School! Here are Farms for the Kids! Falling for Fowler Farms' Apples! 5 Dangers Farmers Face at Work!